WRITTEN BY TY TEMPLETON; ART BY AARON LOPRESTI, DEV MADAN, RICK BURCHETT, AND CLAUDE ST. AUBIN; COVER BY TEMPLETON In stores June 2. The JLA's wackiest warrior takes center stage in his own hilarious, extra-length special, written by Ty Templeton (BATMAN: GOTHAM ADVENTURES)! In "Plastic Fantastic" (with art by Aaron Lopresti), our star is transformed into a pop icon courtesy of his super-popular basketball-shoe commercial! Then, in "The Secreted Origin of Woozy Winks" (with art by Dev Madan and Claude St. Aubin), discover the origins of Plastic Man and Woozy, their past adventures as (sort of) super-spies, and the disgusting reason why Mr. Winks is so woozy! 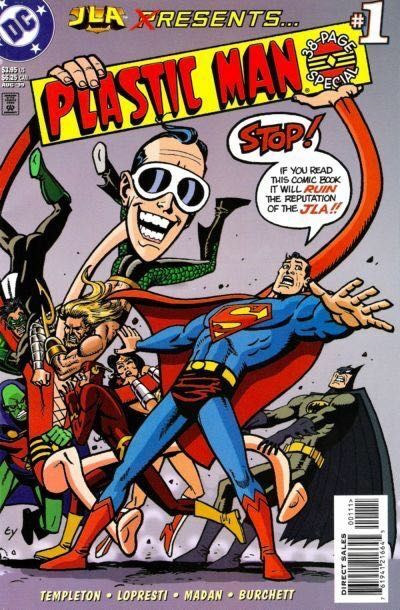 Finally, in "The Age of Crisis on Infinite Clones Saga, starring Plastic Man Red and Plastic Man Blue ? Chapter One Million: Onslaught of the Secret Genesis Wars Agenda" (with art by Rick Burchett), Plas stars in the ultimate crowd-pleasing saga that combines every mega-crossover comic you've ever seen ? in eight pages! For more information, see the feature article. FC, 48 PG.$3.95" Cover price $3.95.